This was another week that presented us with an embarrassment of riches, photographically speaking, of course. We had a photo of a ewe suckling two lambs – one of which had the same off white fleece colour as she did – while the other one was a rich dark black. Then there were three good photos of our buzzard doing his ‘I’m a tree trunk’ impersonation. Buzzard’s first preference is to float effortlessly in circles high in the sky, their second modus operandi is to sit motionless in a tree or on a telephone pole. This minimal use of energy is something they are very good at. We found we’d taken some really nice pictures of cherry blossom and we felt pressured to use one of these as we had shown you the ‘before’ picture, but there seem to be a great many white blossoming trees around at the moment so another one right after the May blossom seemed a bit over the top. We had a steam train on our line too, and I did manage to get one decent picture of it – it was a very misty day and the train appeared out of the mist and then it was gone – luckily we knew it was coming and I was standing at the window with the camera at the ready. But no. 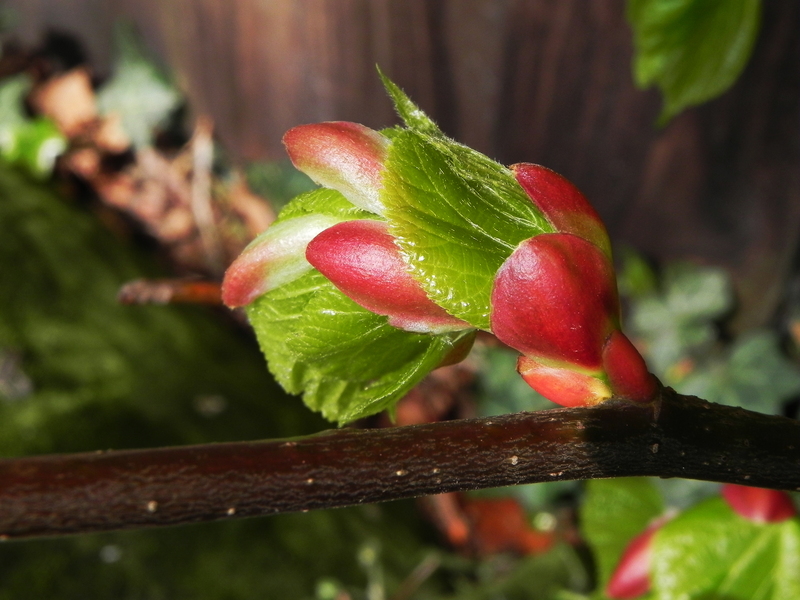 In the end, I decided on this picture of leaves leaving the safety of the covering sheath that has been protecting the bud come rain or shine, until this very minute. There is only one problem. I don’t know what kind of tree it is. It had smooth, rather than rough, bark, so that limits things to 50% of all known trees. I’m inclined to think it’s a Beech tree – but your guess is as good as mine. I don’t suppose you remember (no, you’re far to young) Stan Freberg and his yeti sketch? Glad your Rhododendrons have made it into Spring. I may use some of the other pictures when things slow down in summer. There’s so much to take photos of at the moment – thank goodness! I haven’t heard of Stan Freberg and his yeti sketch, I’m afraid, but I’ll do a Google search for it. 🙂 I know what you mean about a plethora of photograph-worthy sights around us right now. I took a drive in the mountains today, and it was beautiful! Nice to have some mountains around. The Yeti tells me that he can’t get the Internet on his phone – the reception is too unreliable and his broadband went off after the last avalanche. He says he has complained – but the lady on the help desk says that no one wants to come, as there are rumours of a yeti in his area. Still, I gave him the link, so as soon as his phone is fixed I’m sure he’ll be visiting.